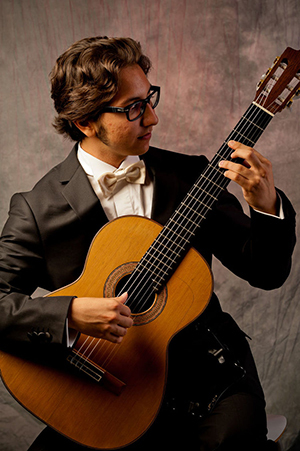 2012 JoAnn Falletta International Guitar Concerto Competition first prize winner and GFA (Guitar Foundation of America) International Concert Artist Competition second prizewinner Celil Refik Kaya has been receiving accolades for his many accomplishments since an early age. Kaya was born in Istanbul in 1991. Because of his great passion for music, at the age of six he began classical guitar studies with his father, Dr. Mehmet Refik Kaya, and later with Yusuf Do?an Büyükö?üt. Throughout his career, Kaya also studied advanced interpretation with Maestro Raffi Arslanyan and gave his first concert in the Cemal Resit Rey Concert Hall in Istanbul when he was six years old. Kaya went on to perform for numerous live television and radio programs in Europe and at age 13 went on to win the 2004 Forum Gitarre Wien which is one of the most important guitar competitions in Vienna. Kaya is a top prize winner in numerous international competitions including the 2009 Sofia Bulgaria Young Virtuosos Competition, 2008 Istanbul Pera Guitar,Festival and Competition, Philadelphia Guitar Society International Guitar Competition,The 30th International Classical Guitar Competion, Naxos, Greece. Pearl and Julius Rising Young Stars Music Competition Queens Symphony Young Soloist Competition, Louisville Guitar Competition, Columbus State University Guitar Competition. He has shown an impressive commitment to new music. He has presented the New York premiere of Roberto Sierra’s Folias with the Buffalo Philharmonic Orchestra, the World Premiere of both Derwyn Holder’s Guitar Concerto with the New Jersey Baroque Orchestra and Turkish composer Suleyman Alnitemiz’s Guitar Concerto with Istanbul State Symphony Orchestra . He was soloist with many other symphony orchestras including the Bilkent Symphony Orchestra, and Mimar Sinan Symphony Orchestra. In 2011, Kaya graduated from the Mimar Sinan Fine Arts University State Conservatory with the Highest Honor Degree and ranked first in the entire conservatory that year. While at Mimar Sinan, he studied guitar with Soner Egesel, chamber music with Vieri Bottazzini. While attending the Mimar Sinan Conservatory, Kaya was granted the “Excellence” Scholarship from the Turkish Foundation of Education. Besides being virtuosic solo guitarist touring around. Kaya also squeezed his busy schedule to devote himself a lot into composition and arrangement Until today he has just finished his Op. 58. His composition teachers were Mehmet Nemutlu and Frederic Hand. He completed his Master of Music studies as a scholarship student of Michael Newman at Mannes College The New School For Music in New York City, as well as private studies with multiple Grammy Award-winning guitarist Sharon Isbin, Celil has now entered the Doctor of Musical Arts program at University of Texas’s Butler School of Music as a Harrington Fellow in the studio of Adam Holzman.